Over the years I’ve listed many homes that belonged to some of the busiest people in Central Florida. These high achievers would make the average person get tired just by looking at their demanding schedules. Showing a home at the buyer’s convenience can sometimes be an inconvenience to the sellers. Whenever I take a listing to sell a client’s home, I always share with them the story of one of my favorite seller’s I’ve ever had the privilege of working with. We will call them the R Family for the sake of this story. Mr. and Mrs. R had built their dream home with a lot of pride and honor. They always kept their home in immaculate showing condition. Every time I would have an appointment, Mr. R would stage the home before I could even arrive to turn on all the lights. He would play soothing ambient music throughout the home, turn on the pool’s fountain, light scented candles everywhere and perfectly dim the lights in every room of the house to present his home in the most beautiful way possible. He was a listing agent’s dream client. I called up Mr. R and I said, “Mr. R, if you don’t want to do this, we don’t have to. I have an agent that wants to look at your home but his clients are back in Rhode Island. He says he knows exactly what his clients like and they will trust him enough to make a buying decision for them.” Mr. R immediately said, “What time does he want to come by?” We set up an appointment for later that afternoon. Before hanging up, I told him to not to trouble himself too much with lighting the candles, playing the music and staging his home like he normally did cause the clients weren’t coming and it was only their agent. When I arrived at the house I was surprised to see that Mr. R had prepared his home as he always did. The home showed as amazing as always and the agent said, “Hooman, you are a man of your word. This home is spectacular and my clients are going to love it.” The agent wouldn’t stop complimenting the home. He said that he was going to recommend that his clients submit an offer on this home before someone else did. I told Mr. R what the buyer’s agent had just shared with me, I thanked him for his time and said goodbye. Approximately 10:00 am on the following morning, my assistant called and told me that I had an offer on Mr. R’s home. I asked for how much was the offer because I was worried about a low ball offer coming from a buyer who had never even seen the home. I was shocked when she told me about the price, terms and conditions. I immediately stopped what I was doing and headed straight to my office because we weren’t that far apart. Negotiating a deal is one of my favorite aspects of the real estate transaction and I was ready to stun my competition with this sale. A couple of counter offers back and fourth and we had an executed contract for $1,875,000. I repeat, we had a contract for $1,875,000 on a home that the buyer had only seen through my virtual tour and approximately 80-100 photos. Closing day came around sooner than later and it was official. 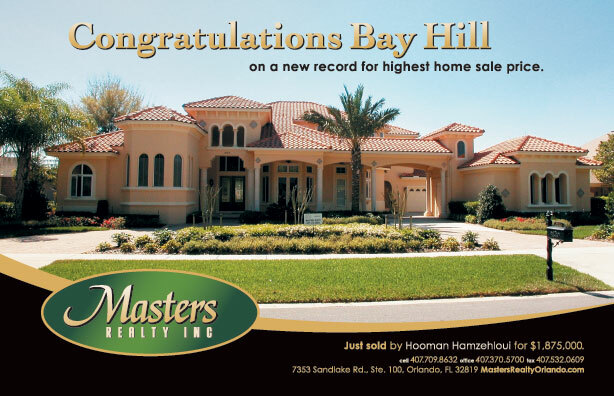 Bay Hill had a new record sales price. The previous record sales price for a home in Bay Hill was $1,400,000 for a lake front home. We got $475,000 more than the previous record for a property on the golf course. Mr. and Mrs. R were so thrilled. Seeing how happy they were had made that day one of the most memorable days of my real estate career. Seeing your clients happier than they ever imagined they could possibly be is an unforgettable experience. This transaction was an invaluable learning experience that I carry with me to this day. When a buyer requests to see a listed home, the agent and the seller must do everything in their power to accommodate all reasonable appointment requests. Because you never know when or where your buyer is going to come from. The most important thing is if you are serious about selling your home, you must always be ready for “Show Time”.